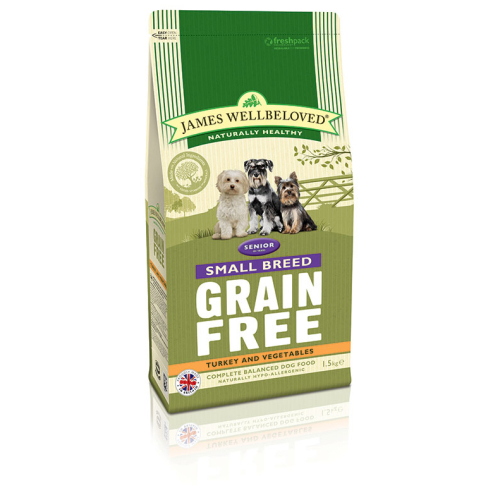 James Wellbeloved Turkey & Vegetable Small Breed Grain Free is a complete dry food that is hypoallergenic, and specially formulated for senior dogs. Containing turkey as the protein source, and selected carbohydrate sources of pea and potato, this is a dietetic food, perfect for the reduction of ingredient and nutrient intolerances. It’s suggested that the food be tried for a trial of 3-8 weeks. If the signs of the food intolerance disappear, continue feeding indefinitely. •	Made with natural ingredients with added vitamins and minerals. Free from artificial colours, flavours or preservatives. •	Ideal for dogs that react to wheat, barley, oats, maize or rice as this dry food is formulated with no cereals. •	Single meat protein of Turkey, which is complemented with tasty turkey fat and gravy. •	Hypoallergenic, therefore it’s ideal for dogs with skin or digestive allergies. •	Contains yucca extract that helps to reduce stool odour. •	Helps to maintain a healthy guy flora. •	Supports the heart with added taurine, and joints with glucosamine & herbs.